Last night, Activision and Bungie turned an airplane hangar in Hawthorne, CA into an ornate temple dedicated to revealing the gameplay of Destiny 2, the newest entry in their FPS/MMO/RPG franchise. Lead Developer Luke Smith took the stage, and he was cheered on by many anxious members of the Destiny community, all of whom were fortunate enough to be granted an invite to this ceremonious occasion. After all was said and done, it was an experience that lauded past accomplishments, capped off by showing that there is so much more to come in the very near future. 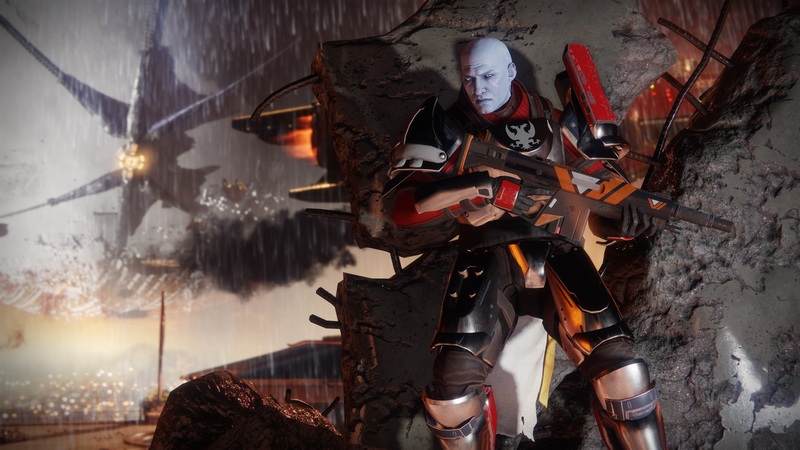 Earlier this month, Scholarly Gamer Billy Arundell wrote about whether or not Bungie had earned some measure of goodwill for the way they responded to Destiny’s underwhelming release. 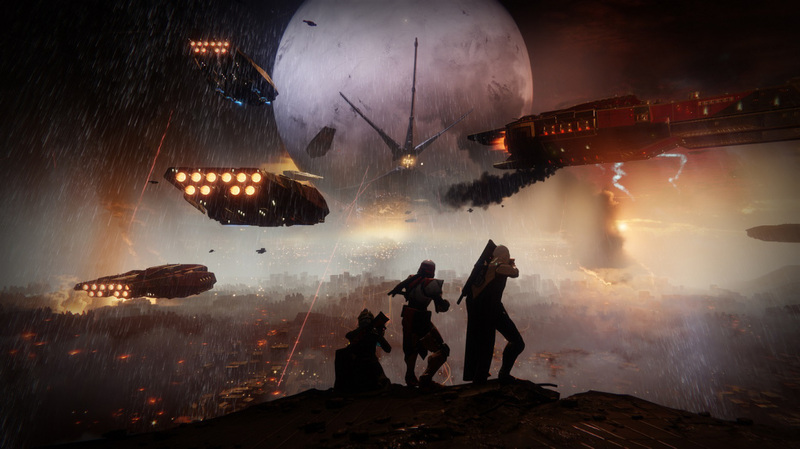 Bungie proved that they were listening to the feedback of the community, and that their opinions mattered when considering how Bungie would continue to shape that world. Thursday’s presentation showcased that the community’s voice might just be the most integral part of Destiny‘s evolution. The first thing shown was a gripping opening sequence called “Homecoming” in which the Cabal, a race of 800lb death machines, launch an assault on Earth and come for The Traveler. For those not invested in Destiny‘s lore, The Traveler is the source of a Guardian’s Light, the driving force behind their power and what grants their ability to resurrect in battle. The Cabal Red Legion and their leader Demonis Ghaul believe that the Traveler made a mistake when he (it?) bestowed his (its?) Light on the Guardians, as they believe themselves worthy of this power. To that end, the Red Legion invade and destroy the last city on Earth while shielding the Traveler in the process. This robs Guardians of all their possessions, and most importantly, their Light. This leaves the Guardian Vanguard scattered across the solar system, setting the stage for the battle to take back what was lost. A world that pulls you in. Always someone to play with. Let’s start with “a world that pulls you in:” Bungie announced that four new worlds will be waiting for you to explore, and the first on that list is Earth. 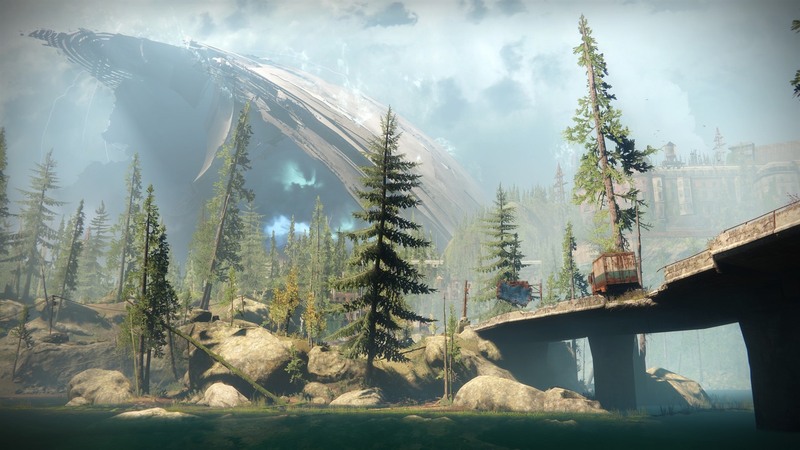 Many were frustrated with Destiny’s version of Earth, as it set players in an area which ended up being far more limited than the open, expansive world promised in early press releases. This seems to be an area that Bungie really wanted to address. The new European Dead Zone is where many have fled the Cabal invasion and set up camp. There, players will meet Hawthorne, a new NPC in the world of Destiny. She is not a Guardian, but fights for their cause and has established the EDZ as refuge. This area is designed to go along way towards establishing a more open, expansive world, as it is twice as large as the largest playable area in the original game. The next three worlds are Titan, IO and Nessus, and players will search these planets to find the scattered remnants of the Vanguard. Zavala the Titan Vanguard will be found on…well, Titan, which is an ocean moon of Saturn where 40-meter-high waves are common. Ikora Rey the Warlock Vanguard will be found on Io, the first area touched by The Traveler on its approach to Earth, which will likely make it integral to Destiny lore. Cayde-6 the Hunter Vanguard can be found on Nessus, a near-total mehanical planetoid, courtesy of the Vex. Players will love hearing that it will be a little easier getting to these rich, new environments as players will no longer be required to enter orbit to select a destination, as they will now be able to jet off at any time via the map. When it comes to “amazing things to do,” Destiny 2 will have new Strikes and a new Raid, Bungie’s ultimate end-game challenge, the details of which will be revealed closer to launch. Public Events are getting Heroic challenges and new Lost Sectors will offer Dungeons to explore. Some changes are coming to the Crucible, Destiny’s flagship PvP offering. In addition to new maps, a new attack/defense game mode called Countdown is is set to debut, and perhaps the biggest change mentioned is that Destiny 2 will no longer offer three- and six-man fireteams for PvP multiplayer. All game modes in the Crucible will now utilize a fireteam of four, with the new Raid being the only content set to support a six-man fireteam. The third item, “always someone to play with,” was where the original Destiny received the bulk of its criticisms. Matchmaking was available, but not for the game’s post-launch content like The Nightfall, The Raid and Trials of Osiris. Bungie intended for these endgame experiences to be played with a group of friends, and they didn’t believe that matchmaking would properly serve the experience. As a result, only 50% of Destiny players who finished the campaign ever completed a Raid. Solo players had to resort to third-party websites in order to assemble a fireteam for any of these activities, with varying levels of success. The integration of Clan support changes this. The most useful aspect of this will be the involvement of Clans in endgame matchmaking. If a Clan is short a player for any particular activity, they can now search for a solo player to fill that spot. If you are a solo player, you can temporarily join up with a Clan to help you enter and complete that activity. 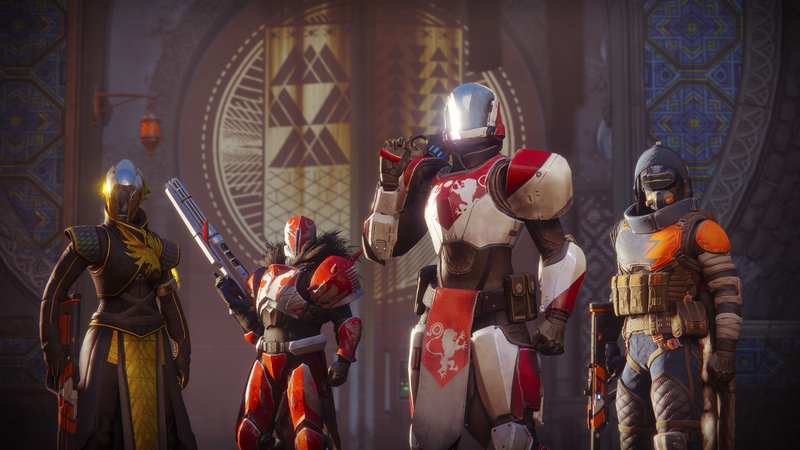 Bungie hopes that this will help solo players become a member of a Clan, and this also helps ensure that six strangers don’t get paired up to tackle difficult endgame content. Bungie then closed the presentation by presenting some real, actual gameplay. Many of Twitch’s most popular Destiny streamers were invited to the reveal, and they were treated to getting some time playing Destiny 2. Some of the changes noted were that weapons are no longer broken into Primary, Secondary and Heavy classes. They are now separated into Kinetic, Energy and Power types with multiple classes of arms available in each category, which allows for a greater multitude of loadout options. Three new subclasses were also released: Sentinel allows your Titan to run around and strike enemies with a shield, which can also be thrown for ranged (and ricochet) kills. The Dawnblade gives the Warlock levitation and a Flame Sword that delivers massive slam damage, as well as the ability to block incoming attacks. The Arcstrider gives the Hunter a spear/staff charged with electricity that allows them to cover great distances and deliver brutal melee kills. Finally, Destiny 2’s PC plans were revealed. The game will be a Battlenet exclusive, which means that it will be the only place to download the game (and future DLC). This move not only keeps revenue in Activision’s hands, but they hope that this move will assuage the fears that the PC version will be subject to rampant cheating. More information on Destiny 2 is sure to come around June 13-15, during E3 2017 in Los Angeles. Those who pre-order the game will receive beta access, which is scheduled for sometime this Summer with an official date not yet released. Be sure to check out Scholarly Gamers for more news on Destiny during E3!